If you’re bored or struggling to get to sleep, then I’ve uploaded some light reading to keep you amused. I’ve just added my honours dissertation to the downloads section, under the ‘Study’ category. It’s an exploration of eschatology, and in particular resurrection. It’ll also form the basis for my Masters research project. I want to look at other areas of eschatology such as heaven and hell. I also want to explore the ethical implications of the resurrection theology I look at in my dissertation and also the ecclesiology of it. If none of that makes sense, feel free to ignore this post. 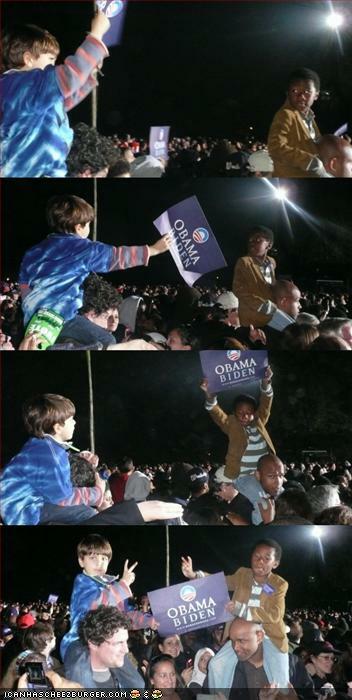 One of those irreverent politics sites I mentioned had this photo available for captioning. It’s definitely one of those Kodak moments that you couldn’t stage. It’s also one of those photos that really needs no further comment, so I’ll not. I don’t generally comment on politics, for various reasons, not least of which is that I have little time to spend following issues and arguments and so I feel particularly unqualified to comment. This is especially true of US politics and the election of the new president. I confess ignorance about the specific policies of either candidate other than that gleaned from ‘propaganda’ on various irreverent websites I lurk around. I get the sense that there are positives and negatives on both sides and that neither is the perfect person for the job. But then, who is? What I do feel encouraged by is the strong desire for change and for the ‘maturity’ to embrace it. Particularly so in the selection of an African-American. Whilst ‘isms should not be an element in such a decision, there’s no escaping the fact that they are – overtly in the more ignorant accusations against Obama or the sexism aimed at Palin or the more subtle undercurrents that we are unaware of but influence our decisions. Perhaps more importantly than the desire for change is the overcoming of voter apathy and the sense of ‘enfranchisement’ that the potential for change has brought. That, more than anything, has been the hallmark of this particular political battle. People have seen a personal ‘hope’ and have become energised by it. Obama is far from being your typical Afro-American and yet still seems to encapsulate the ‘possibility’ of ‘everyman’ achieving a goal. It would perhaps be pertinent on a blog more generally concerned with theology to do a cheesy “and in a funny way that reminds me of…” link to something but I’ll resist the temptation other than to suggest that those who would minister to God’s people would do well to remember that it can be all too easy, through our ‘isms, to ‘disenfranchise’, even unintentionally, those who would seek God. And when ‘hope’ doesn’t mean happier tomorrows, more money or a bigger house but rather is an acknowledgement of a person’s struggles, a validation of their deepest concerns or a simple recognition of their existence then we are bringing the gospel into the very heart of a person’s needs. 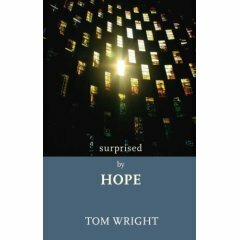 I’ve been reading Tom Wright’s book ‘Surprised by Hope’ and he is very adamant that it isn’t. His main contention in the book is that the main focus of preaching and teaching in the western church has been about ‘fitting us for heaven’. It’s the place Christians go when we ‘shrug off this mortal coil’. There’s no better achievement than to leave this world behind and for our immortal souls to live eternally with God. It’s the focus of much of Evangelicalism – saving souls. It’s reinforced by our hymns, prayers and liturgy. And it’s also utterly wrong, or at least short-sighted, according to Wright. To focus on heaven as an end point is to bow to a Platonic understanding of life – essentially, what is physical is undesirable, what is spirit is to be desired. It’s a dualistic world-view where physical is bad and spiritual is good. And yet, when God created the universe (the physical) He declared that ‘it was very good’. Furthermore, the teaching of the New Testament does not give heaven as our final destination. We are not destined for some nebulous, cloud-sitting, harp-playing, spiritual existence. The focus of the Gospel, the good news, is that ‘death has been defeated’. Not in some spiritual sense but it bodily actuality. The resurrection of Christ bears testimony to that. He is the ‘first fruits’. He is the pattern to which we will all, one day, be conformed – a new, physical, life, not bound by death and glorified by God. And what’s more, this is not a promise for people, but is for all creation. After all, where are the physical to live if not in a new world – a new-created and joined heaven and earth? And that resurrection body overcomes the decay of death, not by our own power, but by that of the Spirit. This is the main thrust of Wright’s book and he explores some of the implications of this. Perhaps the single, biggest implication is for the here-and-now. In re-creating us in resurrection life, God affirms the goodness of creation, of physicality. Life matters! And it matters in the here-and-now as well. What we have, in the gift of the Spirit now, is a foretaste of that resurrection life, albeit a pale shadow, seen in a mirror dimly. Wright suggests that in the new heaven and earth, there will be work to do. We will be called to fulfil our duties as stewards of creation – a duty we’ve largely failed at now. Our Spirit-filled life now should be a reflection of that. The purpose of evangelism is indeed salvation, but not for the sake of ‘saving souls’ (that’s back to the dualist view of physical bad/spiritual good), but for bringing people to Christ so that they may know the Spirit and thereby be empowered to bring about God’s kingdom on earth (Thy will be done, on earth as in heaven) as a foretaste of the full glory yet to come. And yes, there’s still a place for heaven, hell and judgement but you’ll need to read the book for that (or catch me in a quiet time to blog about it). This is the first time I’ve read any of Wright’s work, apart from a brief foray into it last semester for academic purposes. But, I have to say, so much of what he writes (in this book anyway) resonates deeply with my own outlook. As my theology has been shaped by my learning at uni, I’ve been aware of many gaps. I’ve also been aware of deeper discontent with the Evangelical focus on a future in heaven (often to the detriment of our duties on earth). This book has filled in some of those gaps (or at least given me much raw material with which to start filling them in) and I look forward to reading more of Wright’s work. I’m told that his commentary on Romans is excellent, so I guess I’ll have a busy reading list over the summer.